Episode 6 is probably my favorite episode so far for being so intriguing and exciting. The stakes are raised even higher in this episode and there are so many gambles and risks that come into play when one wants to do something their way. Two old lovebirds also meet for the very first time since their last unfortunate meeting and unlike what we expect, there is still some hint of love roaming around between the two, even when the incident that caused them to end everything only screamed out anger and frustration. Maybe things aren’t as bad as what the drama and characters themselves made everything out to be. From where we left off in episode five, Sohyeon battles Dal Hyang in a duel for General Yong Gol Dae. However, before they could determine who the winner is, Yoon-seo interrupts the fight and pleads for the both of them to stop. Dal Hyang ends up being taken away while Sohyeon returns to his room to be treated for his injury by Seung-po. While treating his injury, Seung-po points out that Sohyeon was being jealous which is why he acted the way he did. 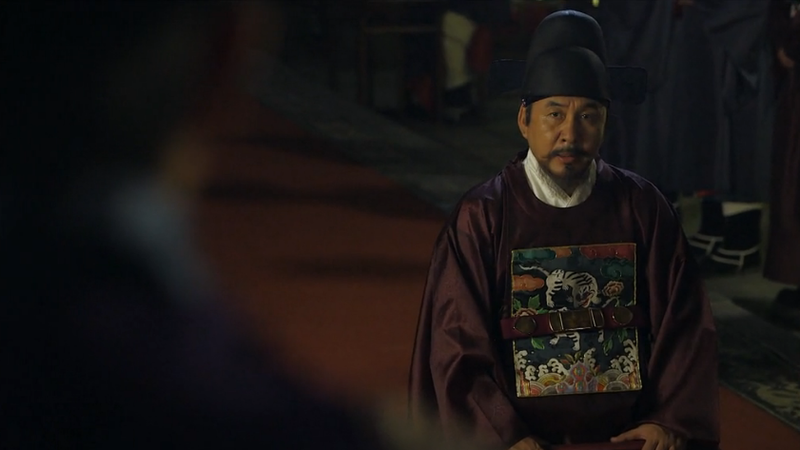 Of course the prince tries to deny it, but Seung-po believes otherwise. Yoon-seo also enters Sohyeon’s room unexpectedly while Sohyeon is being treated, so what she’s treated to is a nice half-naked Sohyeon. Haha. Her reaction towards seeing him half-naked is so darn adorable. She volunteers to treat his injury so Seung-po leaves the room. Min-seo is looking after Dal Hyang who’s placed in the same library as General Yong Gol Dae. Min-seo leaves the library after tying Dal Hyang to one of the book shelves, leaving him alone with Yong Gol Dae. Dal Hyang begins to cry which grabs the attention of Yong Gol Dae so he approaches Dal Hyang. Dal Hyang expresses how he finds it ironic how Yong Gol Dae is supposed to be captured and beheaded but here he is free and saved while Dal Hyang is held captive (oof, that must hurt!). Back at Sohyeon’s room, Yoon-seo is helping treat Sohyeon’s injury he got from the battle. He refuses to answer any Dal Hyang related questions nor any questions regarding the woman that stole Yoon-seo’s letter. What he does do though is ask Yoon-seo what it is about her that made Dal Hyang become attracted to her so much that he was unable to forget her. They both reach the conclusion that maybe she’s just that attractive so Sohyeon asks her to show him what is so attractive about her. Yoon-seo becomes nervous at his constant request so she fires back, “I asked you about the woman!” Haha. So cute. Sohyeon tells her that it’s best she doesn’t know who the woman Dal Hyang was referring to earlier is…and he sincerely means this. While talking to each other, Seung-po interrupts the couple by telling Sohyeon that their teacher is planning to go see the King so it’s best if Sohyeon accompanies their teacher. Before leaving, Yoon-seo tells Sohyeon that she would like Sohyeon to keep Dal Hyang as far away from the both of them as possible and for both Sohyeon and Dal Hyang to not get involved with each other anymore while still allowing Dal Hyang to do what he wants to do. Sohyeon returns to the library and talks with General Yong Gol Dae about Dal Hyang. He asks the General to help him tame Dal Hyang by fighting with him since he knows Dal Hyang’s weaknesses from fighting with him a few times before. Sohyeon wants to continue with the battle so he threatens Dal Hyang to fight with him once more and for his two guards to bet on the winner (Seung-po bets on Dal Hyang while Min-seo unwillingly bets on Sohyeon). The duel between the two begins again in the library, but this time, Sohyeon receives some help from Yong Gol Dae who had given him some advice on Dal Hyang’s fighting skills. While fighting Dal Hyang, Sohyeon takes into consideration all the advices he had received from Yong Gol Dae which lead to his win against Dal Hyang. Dal Hyang ends up getting defeated so like promised, he is to now quit his job as a military officer and return home. He quietly exits out of the library without saying a word while Sohyeon goes back to continuing his talk with Yong Gol Dae. Dal Hyang returns back to his room to gift Pan Se some money for his service. He reveals that he’s heading back home so Pan Se should go back to working for his original master Seung-po. Dal Hyang leaves with his horse once he expresses his thoughts on returning home (I find it super cute how Pan Se refused to be Dal Hyang’s servant at first, but then once he finds out that he’s not going to be Dal Hyang’s servant anymore, he gets all sad and heart-broken. So cute but sad). Back at the library, Yong Gol Dae reflects upon Sohyeon’s idea: he will ensure Gol Dae and his envoy team safety, but he needs some time in order to do so. While thinking about this, he hears someone unlocking the doors to the library and prepares himself for whoever it may be. Min-seo is in the front still guarding the place when he comes across the Princess’s servant who had arrived at the library to check to see where Dal Hyang is since the Princess wants to know. Min-seo explains to her that Dal Hyang has been released and is gone from the Palace so the servant leaves. When Min-seo goes to check up on Yong Gol Dae, he discovers that the lock has been changed (OMG) so both guys go after her. The servant ends up secretly meeting No Soo, the guy messenger that works with Mi-ryung. She hands him the key to the lock, but before letting him leave, reveals that she might have gotten caught by Min-seo. Poor servant. She just caused her own death, because once No Soo hears this, he kills the woman. Dal Hyang chases after the servant after witnessing her suspiciously leaving the palace and finds himself face to face with No Soo. He chases after him, but trips on the servant’s body along the way (omg poor Dal Hyang. He has bad luck with dead bodies). Sohyeon and his two guards come to the conclusion that someone knows about Yong Gol Dae being in the library since they locked him in there, but the only problem is that they don’t know who it is that knows. Kim Ja Jum unexpectedly re-appears at the Palace in front of the king and ministers. He reveals to the king that there is someone within the Palace who is working with General Yong Gol Dae and being loyal to him all the while staring at Sohyeon (omo omo omo). He hands the King his evidence on what happened in the city a while ago and states that there was a fight where someone got injured. Kim Ja Jum believes that there are people helping Yong Gol Dae which is why they still haven’t found him yet to this day. He encourages the King to search those closest to him first since they could be his enemy. He even hints that maybe the person helping YONG Gol Dae could be of a higher position that’s inside of the room they are in at that moment. Oh ho ho, things are getting gooooood. Using her last few breaths, the Princess’s servant explains to Dal Hyang that Mi-ryung was the lady that was chosen to be the Crown Princess. We then witness a few flashbacks of the servant talking with Mi-ryung and of a younger Mi-ryung when she was greeting the Queen. The servant is confused as to how Mi-ryung was able to make it out alive when she was ordered to be killed, but Mi-ryung just talks comfortably to her, asking her questions about Yoon-seo and Sohyeon. The servant reveals to Dal Hyang that she was a spy so that Mi-ryung wouldn’t come back because if she did, Sohyeon would leave Yoon-seo and escape with Mi-ryung since Sohyeon was madly in love with Mi-ryung (aww, so she was basically looking out for Yoon-seo). Dal Hyang keeps all of this in mind as he wonders through the village to talk with the merchant that Mi-ryung ordered some hanbok from. He gives away some details on Mi-ryung’s order to Dal Hyang. Meanwhile, Sohyeon heads to Kim Ja Jum’s house to take care of some business. After handing him the original key to the lock, Kim Ja Jum tells Sohyeon that it’s no use wasting any energy on trying to stop the war – it will eventually happen. He also goes on to confess that what he regrets doing the most was making Sohyeon’s father King since the previous king was a lot better. He criticizes the King, Sohyeon, and the ministers for their actions and ways of thinking and places them as his motives to meet with General Yong Gol Dae. Since he knows that Sohyeon is also teaming up with Yong Gol Dae, he and Sohyeon can be the new leaders of the world. Since Sohyeon is going to be the future heir to the crown, Kim Ja Jum wishes to work with him so that they can both be the leaders (uhhhh no). He warns Sohyeon that since they know about each other’s true intentions now, they can either work together or be enemies. Dal Hyang keeps a close eye on the hanbok that Mi-ryung had purchased from the merchant and follows the deliverers to the location that Mi-ryung is staying at. He sneaks into the room and soon enough meets Mi-ryung in a secret room located underground. While leaving Kim Ja Jum’s room, Sohyeon reflects back on the threat Kim Ja Jum threatened him with. If Sohyeon refuses to work with him, he has no choice but to reveal to the King that it’s Sohyeon who’s being loyal to Yong Gol Dae and the injury on his arm will be used as evidence. Tsk tsk tsk. Since Sohyeon isn’t willing to cooperate with Kim Ja Jum, they have to find a solution to this problem as soon as possible. 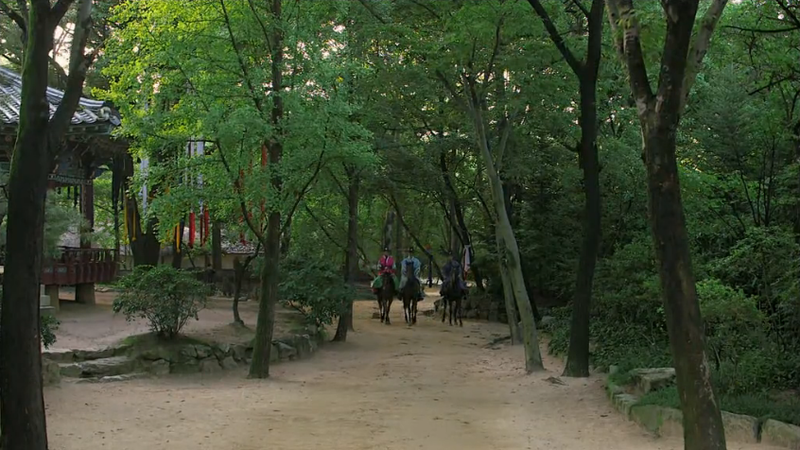 Along the way, they encounter Dal Hyang who has a talk with Sohyeon. He explains about his meeting with Mi-ryung and how she wishes to meet with Sohyeon, but feels as if it might be too dangerous so Sohyeon shouldn’t go. Haha, showing some concern now eh? But Sohyeon isn’t too worried and together they go meet Mi-ryung. Once they arrive at the secret room, Sohyeon enters alone while Dal Hyang stays outside with No Soo. Upon entering, Mi-ryung waits patiently for Sohyeon and then turns around after being aware of his arrival. The meeting is a bit too emotional and intense for her as tears form in her eyes upon seeing Sohyeon while Sohyeon just smirks it off. Dal Hyang ponders back and forth outside the room thinking about all the dangerous things that Mi-ryung could do to Sohyeon. Just then, he hears some noise coming from inside the secret room so he hurries over to find Mi-ryung stabbing a knife in Sohyeon’s chest! But Sohyeon refuses to let Dal Hyang get close to him and orders him to stay back. The episode ends with Sohyeon being stabbed by Mi-ryung and not fighting her off but instead withstanding the pain and misery. 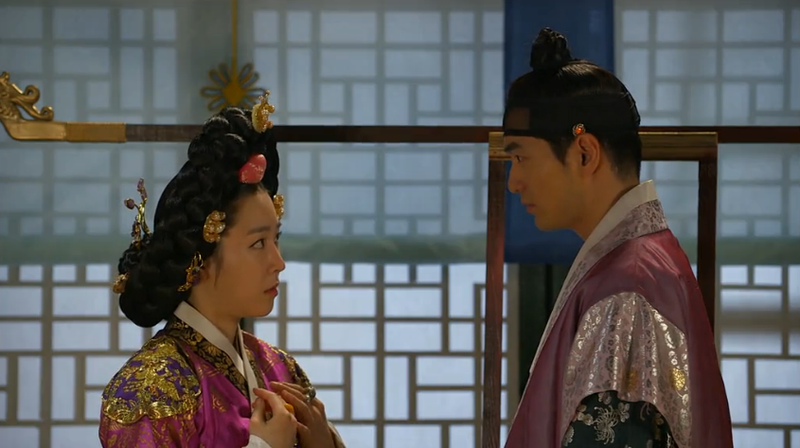 The Princess is really cute interacting with the Prince and it seems her heart is with the Prince now, but the Prince and Mil ryung surely have the sparking of lovers. Poor Princess! Now Kim Ja Jum already got the upper hand in knowing the Prince’s secret and would surely use it agaisnt the Prince either way, how can the Prince clean up the mess now? I’m glad you pointed out about the Prince and Princess’s interactions, because if there’s one thing I’d want to see the most from this drama, it would be more interactions between our Prince and Princess. They’re super adorable together in all the scenes I’ve seen them in and I love how their relationship is awkward but that’s the charming thing about our royal couple. I’m sad that Sohyeon isn’t as explicit in showing his love for Yoon Seo because she could really use some of that, but I’m hoping that in the future he’ll open up to her so that they can make some pretty babies. Hehe. So far Sohyeon is already showing some jealousy so we’re making some progress.